SSL i.e., Secure Sockets Layer is used to build a secure connection between the client and server and it is the most suitable choice to safeguard sensitive information. There is no wonder why SSL validation has become the top priority of many corporate giants so as to create a trusted environment. Nowadays, criminal activities on the Internet regarding SSL are on the rise and people are hijacking connections or websites in order to siphon the encrypted data. This is where SSL verification comes into the picture as it provides a strong identity verification process which is carried out by Certificate authorities. There are a number of inexpensive and new choices in which one can instantly issue the SSL certificates to ensure that the holder of the certificate is exactly who they claim to be. It keeps your website far away from the reach of the hackers and therefore, you do not have to worry about the safety of your website. A lot of fake websites are there in the market that is an exact replica of the original one and use many techniques to tempt you into providing your sensitive information. Since it is impossible for the fake sites to have SSL certificates, you can stay assured of the protection of your important information. Not only does it safeguard your website, but it also boosts its ranking which ultimately results in increasing the brand value of your company. When your website has signed by the trusted third party certificate, your consumers are ensured that they are on a valid site. The customers get to experience safe shopping with secure payments as business sites cannot have a successful credit card transaction without SSL. With the help of an SSL certificate, a company can easily meet the security standards of PCI that are set forth by the payment card industries. 1. DV SSL validation that can be issued without the need of any legal documents by CA i.e., the certificate authorities. But, in order to get the certificate, the applicant has to have a generic address so as to prove that he is authorized and have a full control over the domain name. The option of Domain validation process is the best one for those new and small organizations which want a good start to keep their website safe and protected. 2. 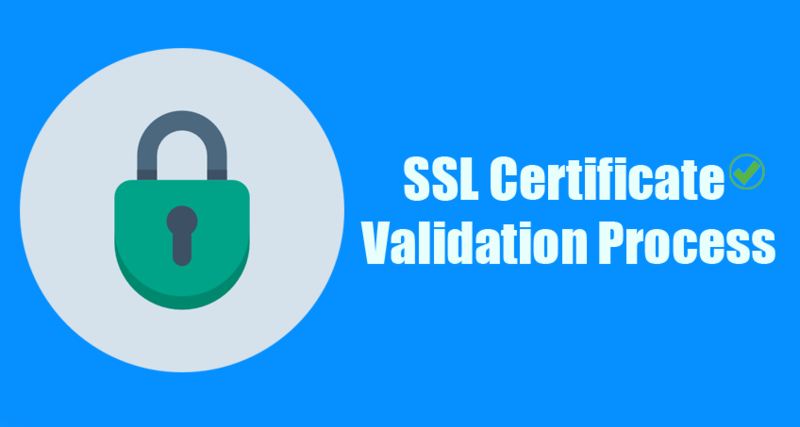 OV SSL Validation – When it comes to OV SSL validation, the certificate authority validates the details of your organization that is associated with the certificate requester. Through OV i.e., organization validation process, you can not only validate your company but it also helps you in verifying your domain name as well. 3. EV SSL Validation – The process of extended validation includes the confirmation of business-related legitimate documents and details of the certificate request. Afterward, the CA takes a few days for accurate verification of the provided details and once the process gets completed, it issues the certificate to the organization. EV SSL validation is a strict and strong authentication process which makes sure that there is no possible threat to the security of your website. It eliminates the risk of a phishing attack by enabling a green address bar in the browser so that the customers can feel encouraged to complete the online transactions. Having an SSL certificate is not only essential for the security of your website, but also for maintaining the trust of your customers so that they can rely upon your services.